Larval food plants are various mistletoes (Family Loranthaceae). 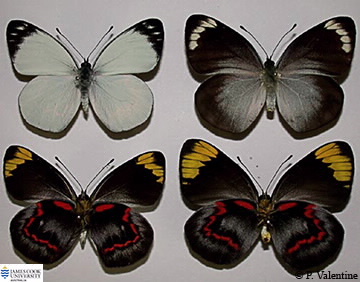 Mature larvae are dark green with 2 rows of yellow spots, each with a white hair in the centre; head black. 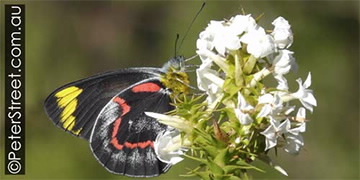 Adults are basically white on upper surface with black tips and margins; lower surface with yellow bands on the fore wings and red bands on the hind wings. Usually found in wetter areas associated with vine thickets and rainforest, often searching for nectar on Lantana camara.